We have our supper club once a month. Stew and I always look forward to it. Four couples together to eat and just hang out! 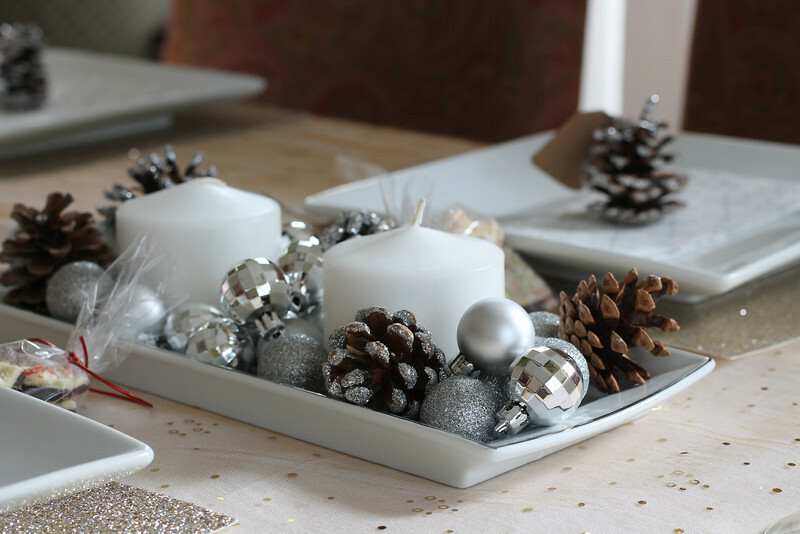 We all love to decorate and entertain, so it’s always a great time! This month, Stew and I hosted. The theme was Silver and Gold. I wanted it to be cozy, yet have all the sparkle of the season! 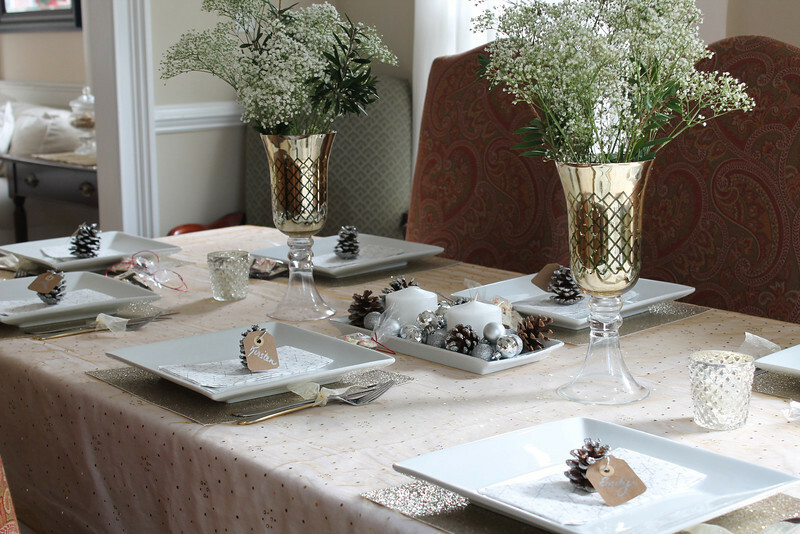 I found a sheer gold sequins fabric at JoAnn Fabrics, which was perfect (and cheap) to lay on top of my white table cloth. For my place mats, I used silver & gold glitter scrapbook paper!! It was nice and thick, so it worked perfectly. 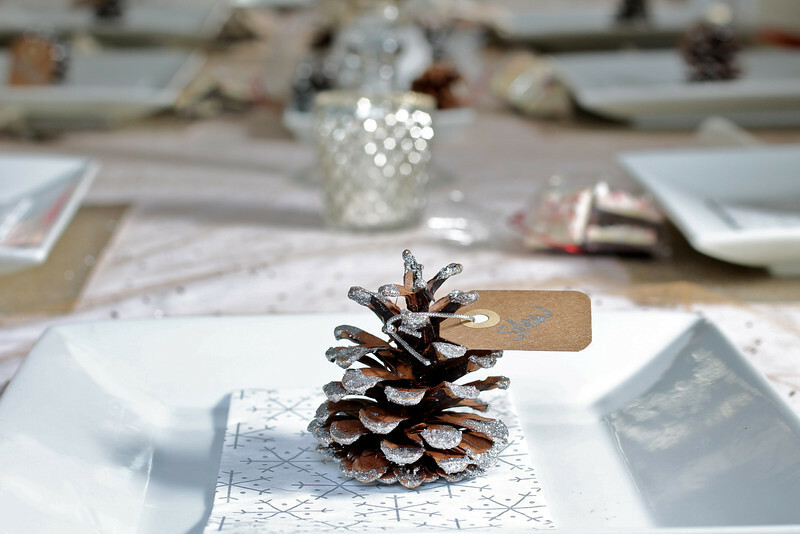 I used silver glitter painted pinecones and tied everyone’s names to them with silver string. I used a silver metallic sharpie to write their names. And, of course, white candles and baby’s breath to brighten it up. Here is my table-scape. 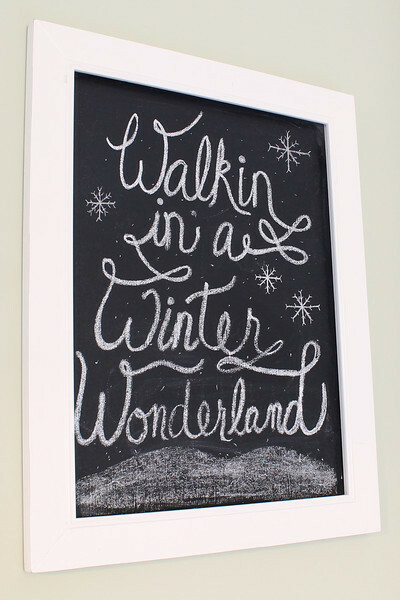 And, of course, we can’t forget the chalkboards! 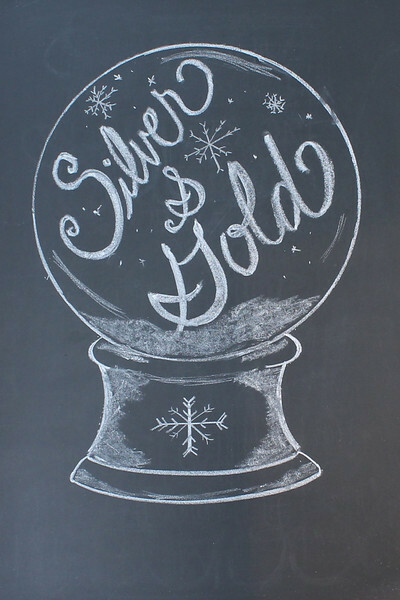 Winter Wonderland and Silver and Gold are now available on Etsy as digital prints! Then, the most important part of the night, THE FOOD! 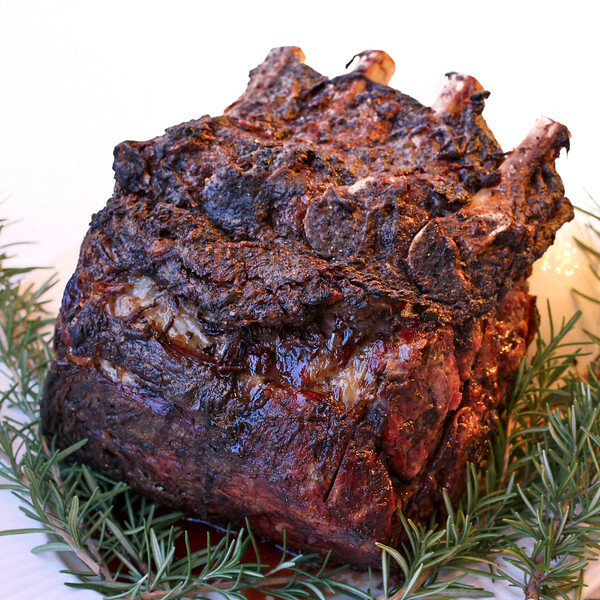 For the main course, I chose a standing rib roast (recipe below). I came across this delicious recipe in Southern Living Magazine. Here is the original recipe. I made a few changes and it came out absolutely delicious! In addition to the roast, I made buttermilk biscuits and roasted brussels sprouts. Annie brought a cheese platter as an appetizer, Kirsten brought a spiked hot cider (vanilla vodka to spike it) and Missy brought homemade chocolate truffles. It was a feast fit for a king! The perfect holiday meal spent with great friends. 1. Prepare Roast: Let roast stand at room temperature 1 hour. 2. Preheat oven to 450°. Whisk together mustard and next 3 ingredients; reserve 1 Tbsp. mixture. Rub remaining mixture over roast; sprinkle with salt and pepper. 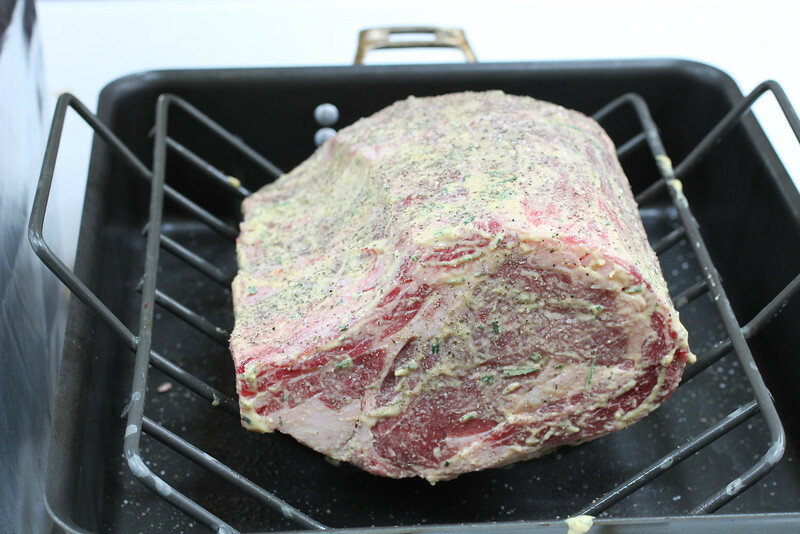 Place roast on a lightly greased rack in a roasting pan. 3. Bake at 450° on lower oven rack 45 minutes. Reduce oven temperature to 350°; bake 1 1/2 to 2 hours or until a meat thermometer inserted into thickest portion registers 120° to 130° (medium-rare) or 130° to 135° (medium). Don’t trust a timer. ALWAYS use a meat thermometer. Let stand 30 minutes; transfer roast to a serving platter. 4. Meanwhile, prepare the gravy: Melt butter in pan over medium-high heat, stirring occasionally and moving pan as necessary to prevent hot spots. Add onion; sauté 3 to 4 minutes or until tender. Whisk in flour. Cook, constantly whisking, for about 1 minute. Whisk in wine; cook, whisking constantly, 2 minutes. Stir in broth; reduce heat to medium, and simmer, stirring constantly, 5 minutes. Stir in reserved 1 Tbsp. mustard mixture. Add salt and pepper to taste. Slice roast, and serve with gravy. Ask your butcher: Have the chine bone removed. A thin bone that runs perpendicular to the rib bones, it will get in the way of slicing once the meat is roasted and has rested. Roast like a pro: Start roasting at 450° for 45 minutes to form the caramelized crust. Then reduce the temperature and finish cooking to keep the inside pink and juicy. The right temp: 125° for prime rib lovers. Remember: The internal temp on large roasts like this will continue to rise as the roast rests. This was one of the best dishes we’ve made in our house. We should make this a yearly tradition.